For the 2005-6 school year, Firewise tools are being used to introduce GIS in 22 classes with over 550 students at 13 schools. Three Firewise Institutes are scheduled for this summer to deliver the Firewise message within an education context of technology, community service, and geography . Upon completion of the training, teachers are then eligible to reserve the Firewise Mobile Lab for their school project. Teachers attending the free institutes receive a stipend, CEUs, GIS/GPS training, Firewise Communities Curriculum and AtlasGDS software. For information on the institutes, see: www.macalester.edu/geography/mage/teachers/institutes/firewise/index.htm. In a current example, students at the Cooperative Area Learning Program (CALP) in Independent School District 196 under the direction of Jane Schroer, Program Coordinator and Perry Lynum, Social Studies instructor, are participating in the Firewise in the Classroom (FWC) Project. CALP goals foster connections between students and the larger community and provide student skills necessary to succeed in school and life. An FWC project is uniquely qualified to meet these goals. As part of the project, CALP was provided a complete Mobile PC Laboratory to use for classroom instruction. Having access to PCs and a printer provided incentives for students to complete assignments. Students completing their assignments were allowed more free time on the computers. With the help of Firewise staff, CALP students learned how to use GIS/GPS technologies to assess the risk of wildfire in their community. Beginning in December 2005, students began conducting a Level 1 (L1) assessment in Eagan and Apple Valley. Recent fires in Florida, Texas and Oklahoma showed the importance of their work. In less than two months, the four CALP students completed over 17,000 L1 assessments. 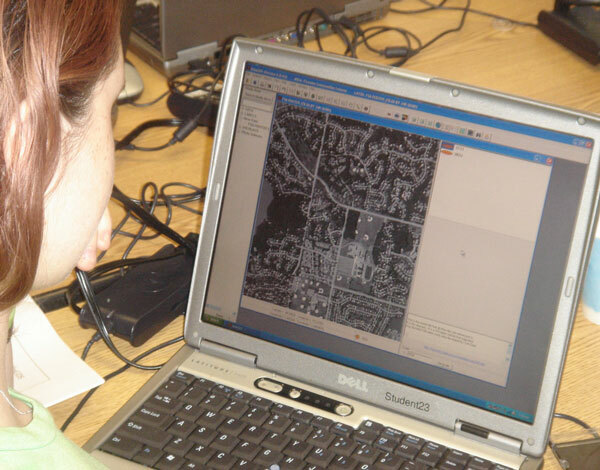 Students used the AtlasGDS GIS system ( www.gis4schools.org and click on AtlasGDS.pdf) to assess defensible space around homes in their community. During this process they learned and used the GIS software with 2003 NAIP aerial photography. All houses in their communities were tagged with a location and rated for defensibility on a 1-5 scale where 1 is not forested and 5 is overtopped by trees on 2 or more sides. This preliminary rating is the Level 1 (L1) assessment. GIS modeling techniques were then applied to the student-collected data to assess overall community risk. DNR staff worked with the students to apply a weighted density surface model to the house ratings. The resultant model easily allowed the accurate visualization of the concentration of risk within the community based on the number of homes and their defensible space rating. The highest risk neighborhoods identified by this analysis can then be field visited and assessed in greater detail. In support of the National Fire Plan, the U.S. Forest Service has provided funding for Minnesota Firewise. Under this program, schools receive GIS software and considerable data both about environmental management, forest health and resource protection. All data generated by this project is shared on request with cooperators. For more information about the statewide Firewise program, contact Dr. Thomas Eiber, tom.eiber@dnr.state.mn.us or visit the Minnesota Department of Natural Resources web site: www.dnr.state.mn.us/firewise or visit www.gis4schools.org to see other Firewise school projects.